← the anatomy of an applique embroidery design! Out of all the sets in this new Almond Silk Paisley collection I love the last set which is now near completion. 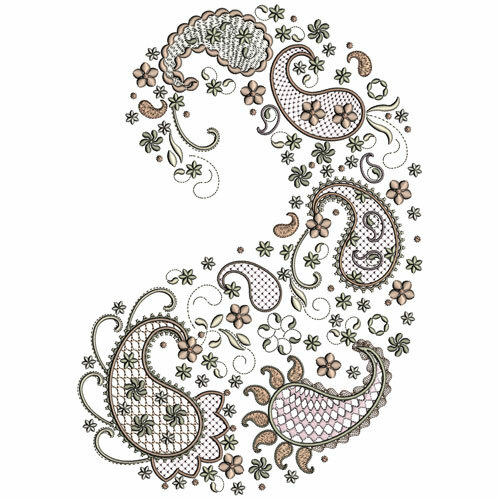 With the larger hoops I am not so limited so I can combine and create much more detailed designs offering you some wonderful designs which I hope will inspire you to get embroidering. I enjoyed myself so much that I ended up creating 20 designs. First of all I began creating some 8″ quilt blocks which are so satisfying to digitise. It can be a challenge squeezing them into the hoop as invariably they come out as 9″ blocks. Mind you I don’t think it will be long before we have wider hoops being released on top of the line embroidery machines. I am waiting to see what Husqvarna will release in the autumn. 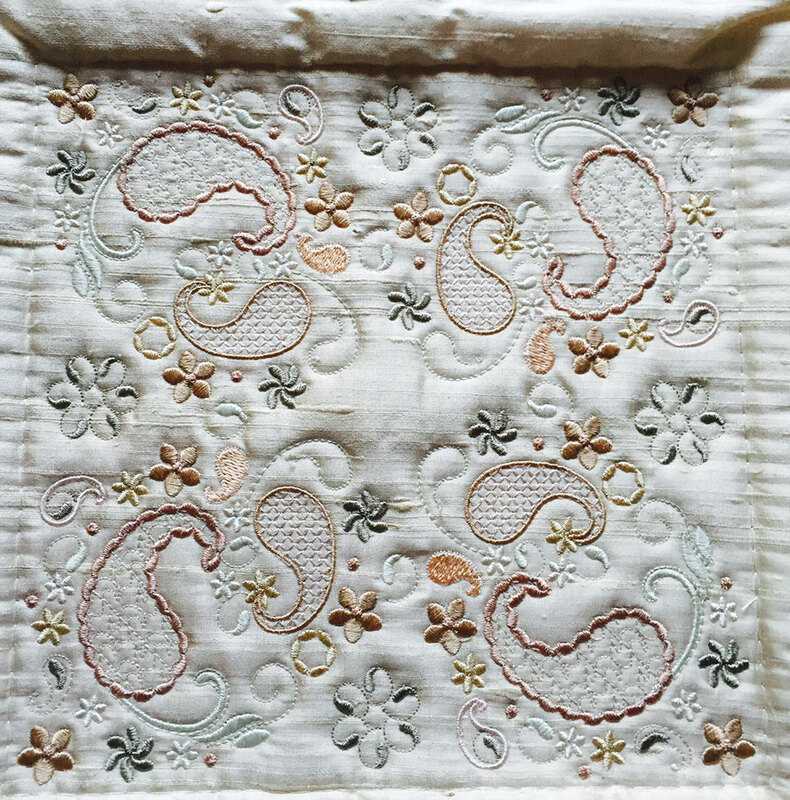 This quilt block was stitched on some slubby ivory silk and has a polyester batting. The result is not very impressive at all. Firstly the colours do not stand out enough for my liking and it is difficult to see that is has any batting. I have been discovering all the various types of batting and wadding, which is what we call it in England. 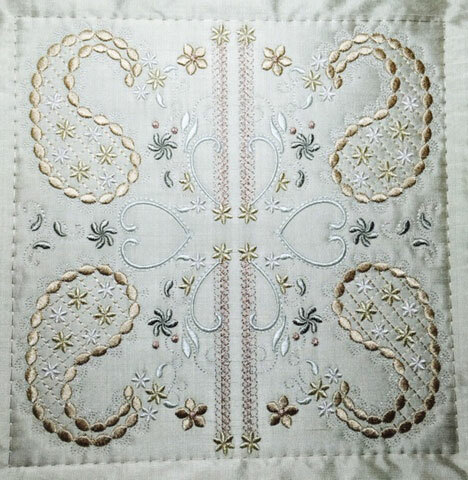 I sent away for a couple of sample packs from the Cotton Patch, a UK quilting shop, which is a wonderful way to check out how various types look. My preference is a wadding which gives a rounded look to the embroidery so I need to look for those with a medium to high loft. 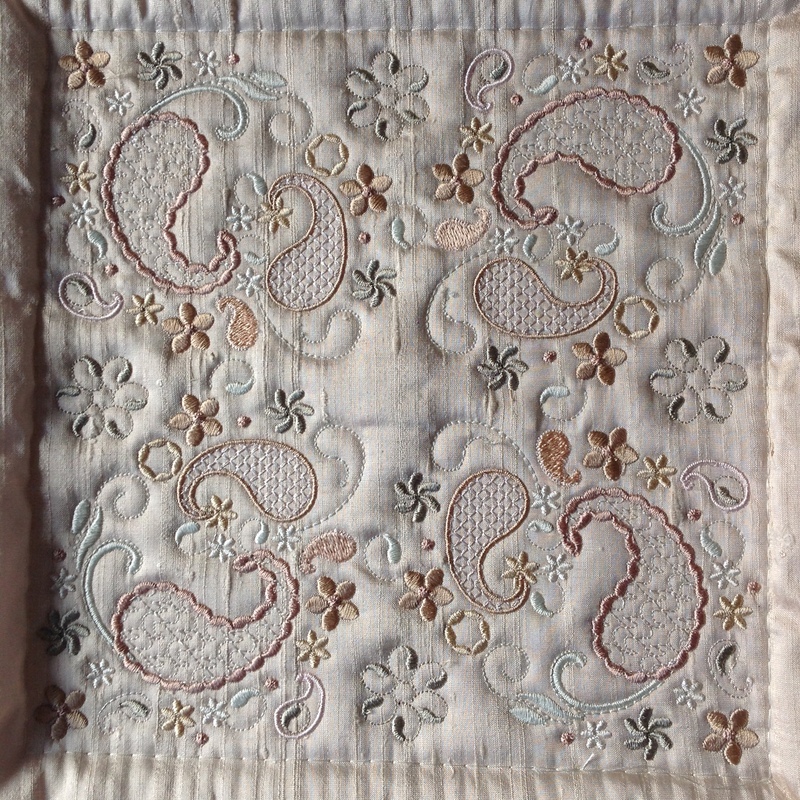 When my quilt blocks are stitched out on brown dupion silk they look very different. 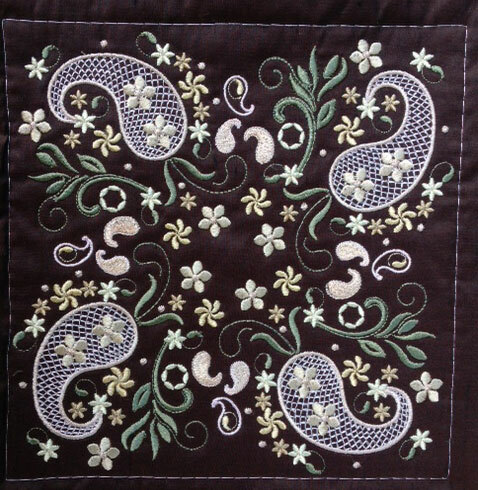 I changed some of the colours for this stitch out as pale colours all appear washed out on a dark background. How alive it all looks too! I used Hobbs cotton batting for this but it is not dense enough for me although it was better than I expected. Now this is what I call lift! I stitched this block with two layers of polyester batting just to see if it would work and what the result would be. However you need to be aware that you get extra lint within your bobbin area so you should clean it out after each block. Your needle will also work very hard going through all those layers so change them regularly. The great thing about silk dupion is that it a blunt needle will be very obvious as you can see around the edges of this sample. I can usually hear that it is not quite right too! This quilt block was stitched on a some lovely ecru silk and it really shows off the colours that I have selected for this collection. The batting used was Hobbs Heirloom Premium which is a 80% cotton and 20% polyester mix. Not bad compared with the ordinary polyester batting. It would seem that the high quality, more expensive battings give the best results. I cannot wait to use the Quilter’s Dream samples especially the cotton deluxe one. The feel of the Quilter’s Dream Orient is lovely too, and I am sure that will give me fantastic results as it is a blend of silk, bamboo, tencel and cotton. This is the last block I want to share this time around. It was stitched on grey green silk and has a Warm and Natural 100% cotton on a polymer base batting behind it. The Almond Silk Paisley collection is now nearly finished. 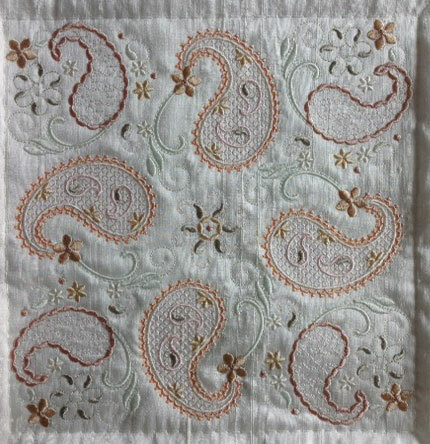 I have added some lovely designs in this final set and I am particularly proud of my large paisley design which consists of several of the paisleys in the collection. As you can imagine it took a while to fill the paisley area with elements from the collection. I hope you like it and embroider it on something where it will attract attention, like a bag or a jacket back! 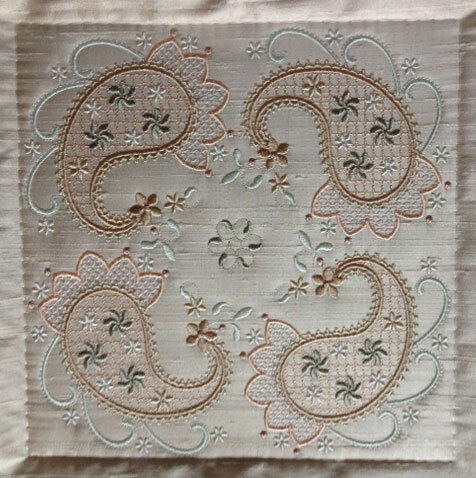 This entry was posted in Discussing machine embroidery, New Designs and tagged batting and wadding, embroidery on silk, machine embroidery, quilt blocks. Bookmark the permalink. It is truly lovely. The biggest hoop I can use is a large by Viking. I am hoping some of the designs will fit my hoop. Can’t afford a bigger machine. I have a Designer Se. The one before the diamond. Even if you do not have a 8″ wide hoop use the smaller designs in this collection to create your own blocks using mine as a guide. Will give this matter some thought as I know not everybody has the wider hoops. Oh how I wish I had a bigger hoop! Hazel, this collection is so lovely. I’d love to see a quilt made of it. We’ll be buying a home soon and as soon as I see what colors would go best (so I’ll know for sure what color of fabric to use) I’m going to try and make a quilt from you 5″x7″ designs. I’ve never quilted before but your beautiful designs call for it!